Texting, accessing the internet and sending and receiving email remain popular. 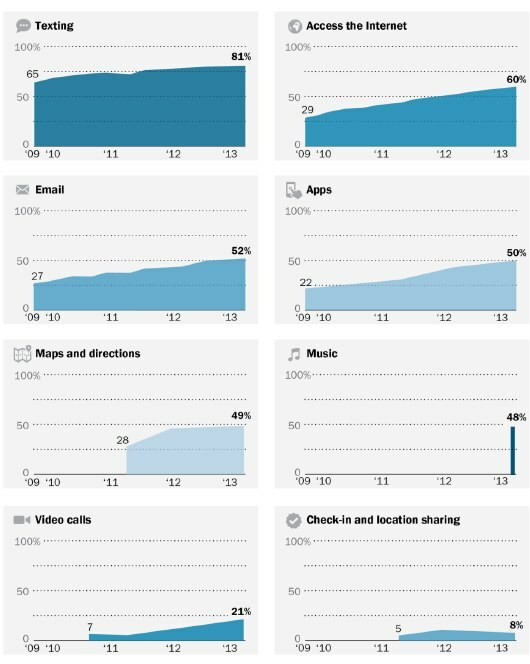 Some 50% of cell owners download apps—up from 22% in 2009. Many use certain location-based services like getting directions or recommendations. Nearly half of cell owners (48%) use their phones to listen to music. 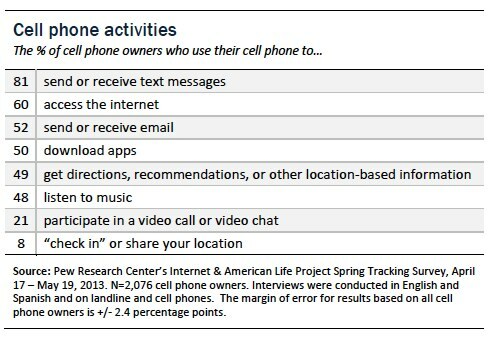 The proportion of cell owners who use video calling has tripled since May 2011. Overall, almost all activities have seen steady upward growth over time. The findings in this report are based on data from telephone interviews conducted by Princeton Survey Research Associates International from April 17 to May 19, 2013, among a sample of 2,252 adults ages 18 and older. Telephone interviews were conducted in English and Spanish by landline and cell phone. For results based on the total sample, one can say with 95% confidence that the error attributable to sampling is plus or minus 2.3 percentage points. More information is available in the Methods section at the end of this report.